The Shark Rocket DuoClean is a lightweight upright that is designed to handle ALL types of floors. This is a unique quality from such a lightweight vacuum cleaner as most models weighing around 10 pounds can’t really handle carpets that well. Not only does it handle high pile carpeting extremely well it also handles tile, linoleum, hardwood, and other smooth floors as well as any other stick currently available. Overall I am a big fan of Shark as their vacuums are almost ingenious in their design. They take a look at the biggest problems facing homeowners who are trying to keep the dirt from taking over and build products to solve them. The Rocket is certainly one of the best you will find for the typical household. You can also quickly convert it to a handheld vacuum by sliding out the extension tube and using any number of attachments. This gives it portability for cleaning such places as your car, your boat, the ceilings, or just about any other place where a heavy machine is just not feasible. Attach the extendable under appliance wand to pull up leftover food particles from under the stove or fridge without moving them. If you can think of a surface that needs to be cleaned, the Rocket can certainly do the job. Another innovative feature found on the Rocket is what they call their Swivel Steering system. One of the difficulties of using larger upright vacuums is steering and moving around the many items found in your home. Shark solves this by making the vacuum rotate around with a quick turn of your wrist. Instead of moving only in straight paths you can now move in multi directions without physically picking the machine up and turning it. Not only will you save time but you will also save energy, especially when vacuuming multiple rooms at once. 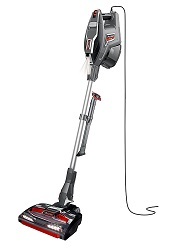 The Shark Rocket is a great choice for anyone looking for a lighter weight, versatile vacuum that can handle a variety of floor types. It really works best on smooth floors which the soft brush literally pulls everything up, but you can also use it on area rugs and carpets. However, for those homes with mostly carpeting you should consider a cleaner with full HEPA filtration which is something the Rocket is lacking. When trying to pull allergens out of the fibers in your carpets you really need maximum suction power and a quality HEPA filter. It’s a known fact that most homes today have many types of floors. Tile, laminate, linoleum, and wood are very popular choices and nobody wants to take the time to use a broom. This Shark makes quick work of large areas and leaves nothing behind, the particles do not blow around at all. 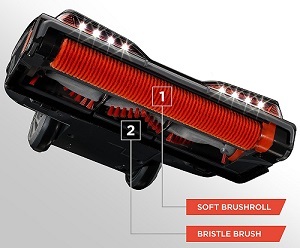 The dual brushrolls work together to attract everything in its’ path. For more information about this model and to check current price levels, click here to visit our favorite eCommerce website.